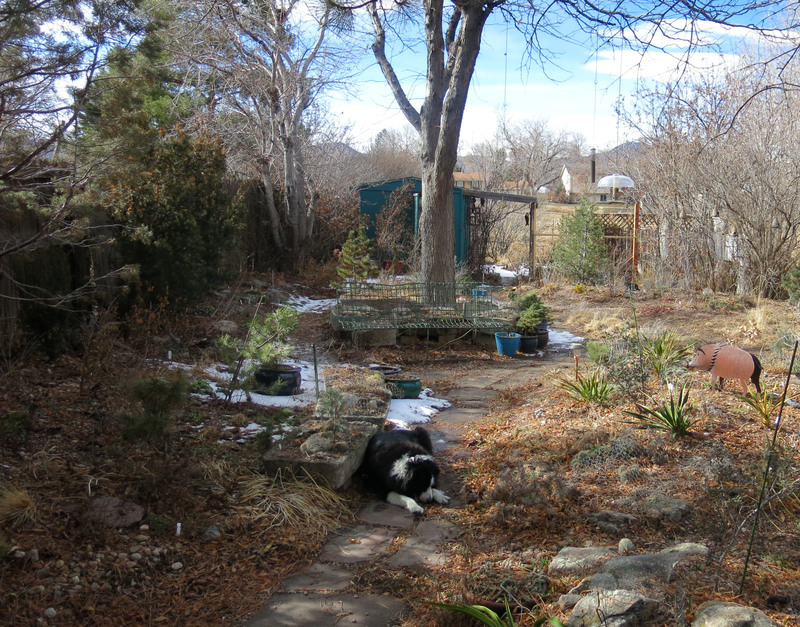 Greetings and salutations, everyone; yes, once again it is I, Chess the purebred border collie, filling in for the guy I live with, and here to bring you the latest news from our garden. You may remember me from such posts as “The Abandoned House” and “The Grape Bush”, among so many, many others. Here I am in a characteristic pose. I guess I’m doing okay. The guy I live with says there’s a Zen saying that goes “an inch of time is worth a foot of jade”, though there are other variations of the saying, and that’s how we do things, day to day. 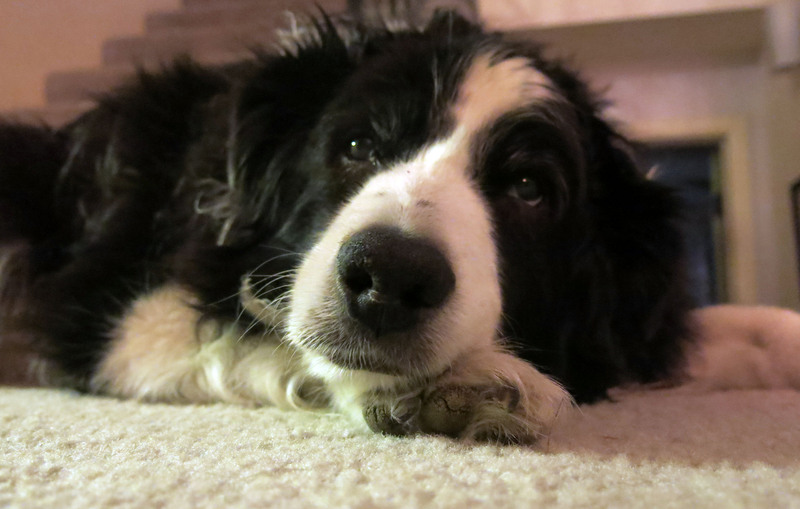 We purebred border collies only live in the moment anyway. All this is my introduction to what’s going on here, and if a certain party could focus more (in every sense), there would be more pictures, but at least I have some to show you. 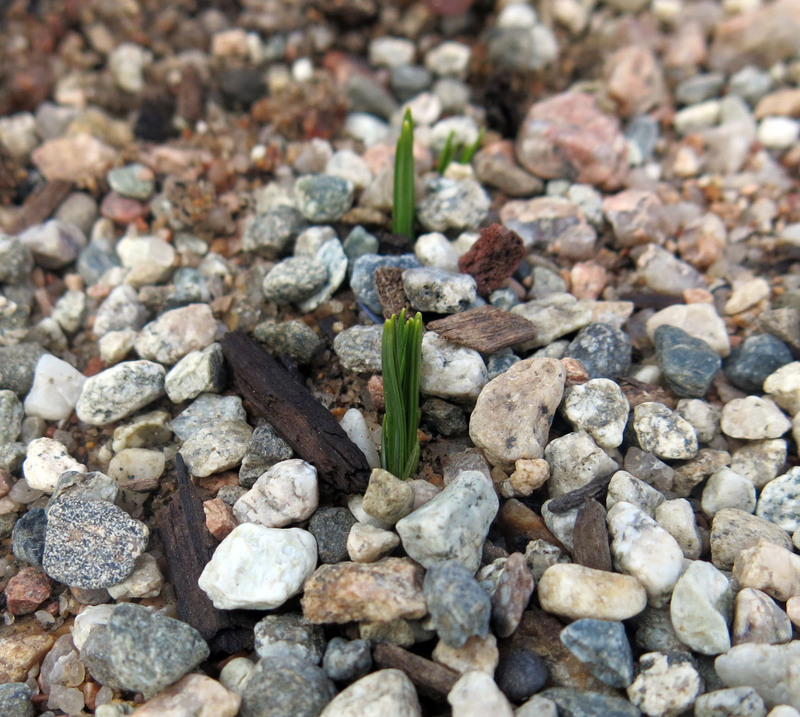 For one thing, the first crocuses of the year poking their noses out of the ground. (The first ones he’s noticed, anyway.) This is Crocus “taurii“, which gets quotation marks because I guess it isn’t the real C. taurii, aka C. biflorus subsp. taurii…..whatever. This is a “spring” flowering crocus. (There really aren’t any crocuses that flower in spring here, but if I said “winter-flowering”, people would freak out and then I would have to say that I really meant “spring”, even though it’s winter.) 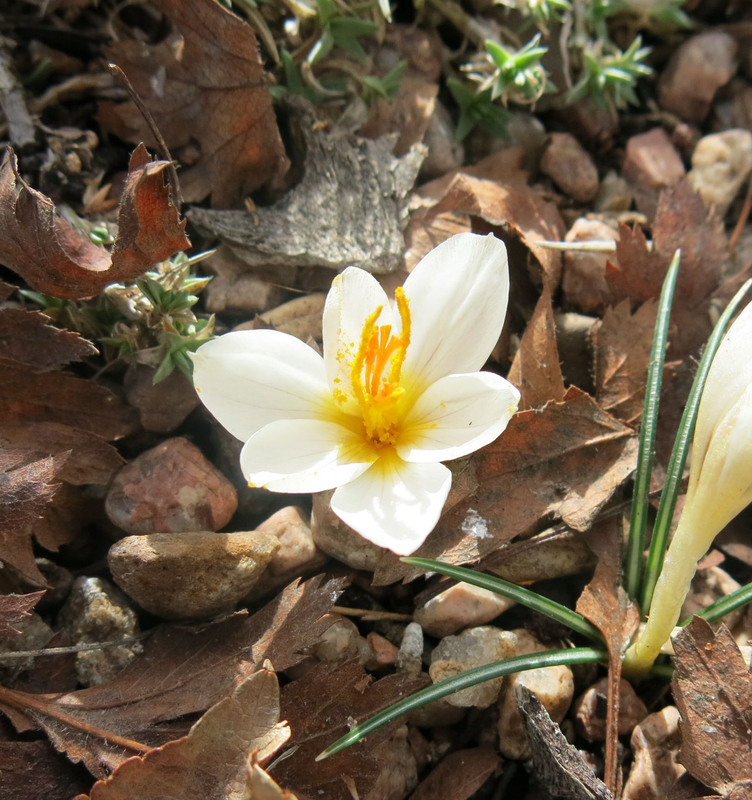 The actual winter-flowering (or autumn-flowering) Crocus niveus, which has produced another flower. This is really late rather than early. The guy I live with feels it obligatory to tell people he has four forms of this crocus. I think he’s a snob of some sort. Well, he does have a purebred border collie, so I guess he is. 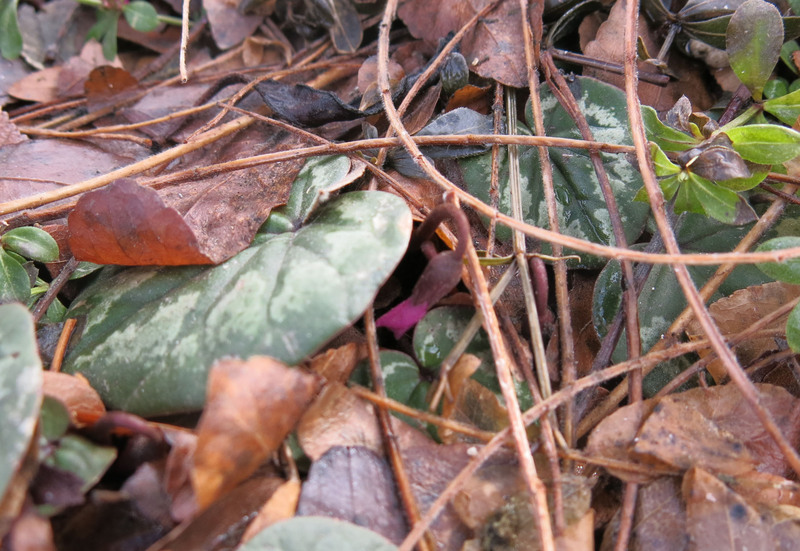 Some color showing on Cyclamen coum. There are way more snowdrops flowering than this, but you get the idea, maybe. 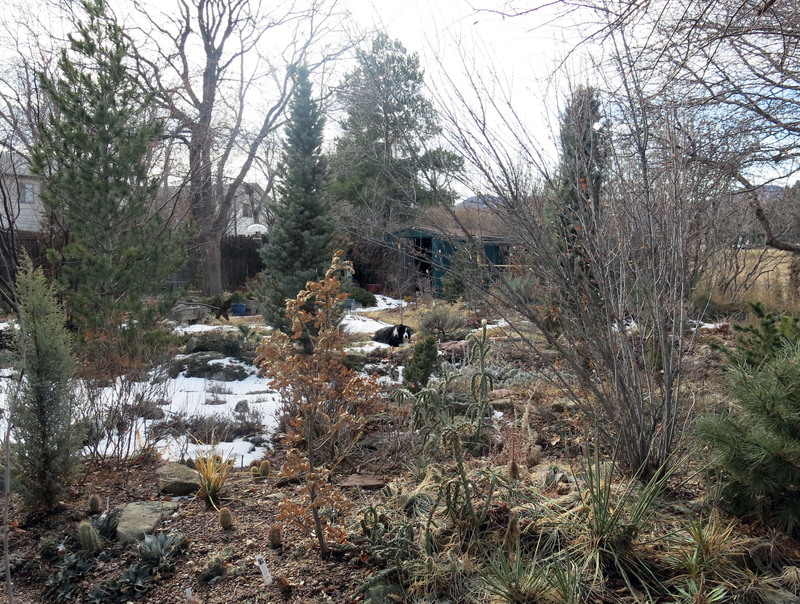 It’s a pretty nice day, and most of the snow that fell two days ago has melted. It should be all gone by the time it snows again. I’ll end my post with four extremely excellent garden pictures. You do enhance the garden. Thanks; I thought the garden needed some enhancing. 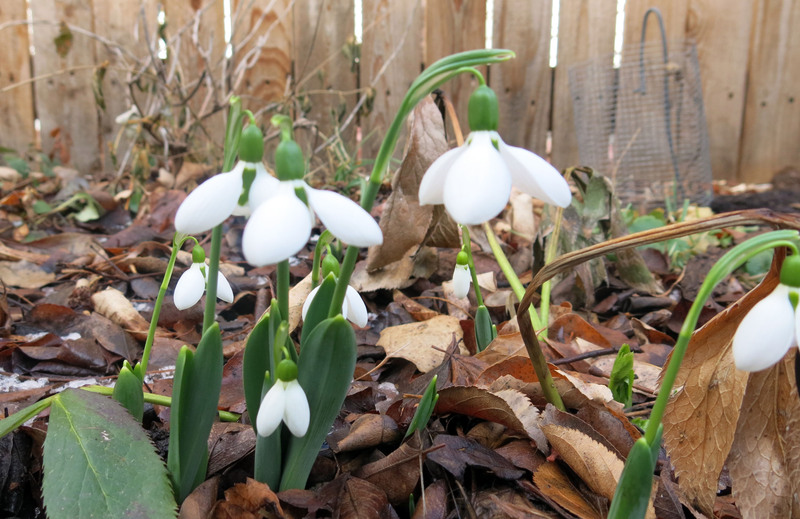 The guy I live with had this idea of spending “a jillion dollars” on snowdrops, until he came to his senses. You can order them from some places overseas, but you have to spend a hundred or so dollars just on an import permit. ….. I just bought 2 pots of the Cyclamen coum and I go out and look at them every day. Do they spread like the hederifolium? I hope so. Not that I have much of the hederifolium. I bought some seeds a year ago and they just sprouted. And, I must confess, I dug a few up that were spreading through a chain link fence into a park I frequent. They wouldn’t have done well with kids trampling them right? So I saved them. Right? Chess, what are you examining so closely in that last picture? I’m definitely going to get some snowdrops this fall. I’m sold. Um, in the last picture I’m eating dirt, which is “undignified for a purebred border collie”, but maybe I need the minerals, because of my condition or something. I know from my own experience that Cyclamen coum spreads like wildfire. They’re all over the part of the garden that they’re all over, if you know what I mean. Just don’t hurt ants you see in the garden, because they carry off the seeds. A process called myrmecochory. The guy I live with talks about this all the time, which is how I know. 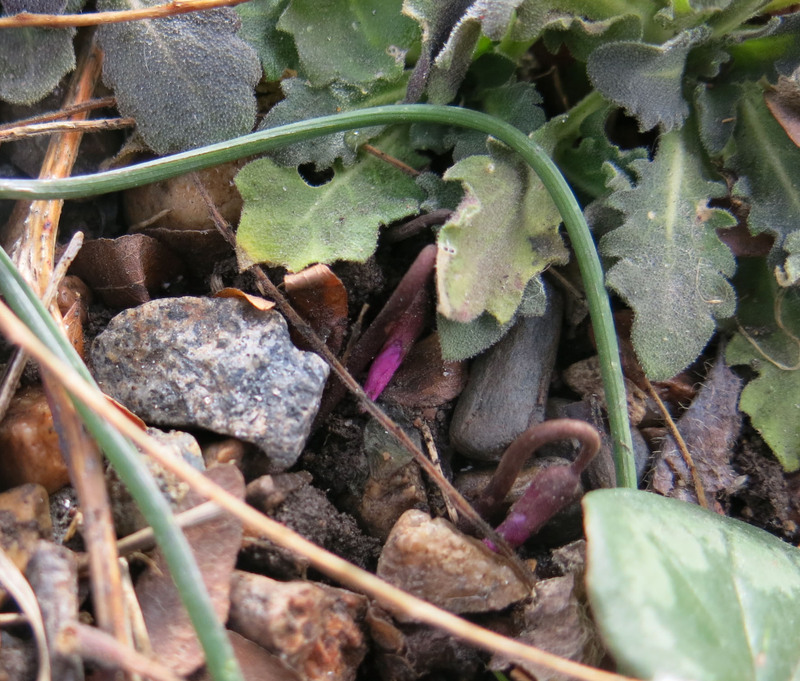 Ants like the sticky sweet elaiosome around the seed, and that’s how the cyclamen get spread. Crocuses and snowdrops too. 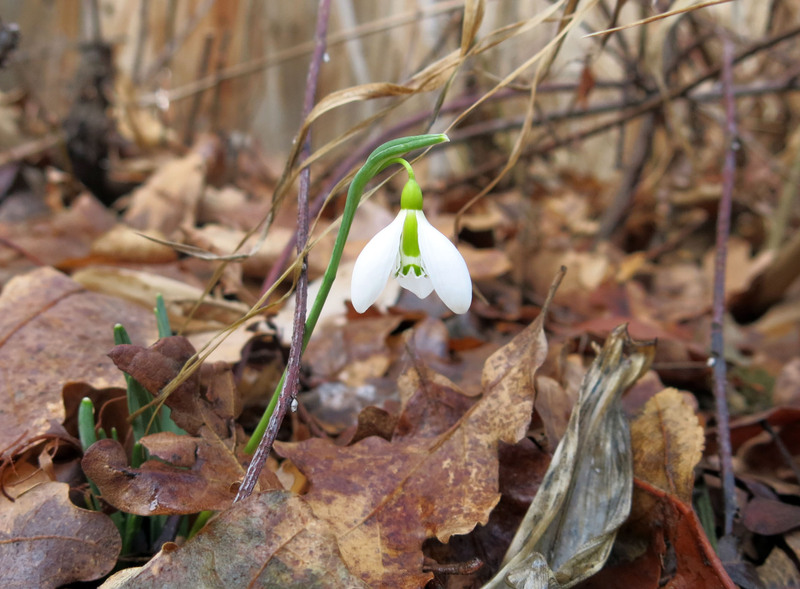 Snowdrops that have snuck across the property line have been brought back, in secret of course, so I think you did okay. I, also, like the taste of dirt. I don’t like getting dirty in it, but I do enjoy licking a smooth pebble or two. Supposedly you can quench thirst by sucking on a rock, like if you were lost in the desert or something. In fact, though he wasn’t lost in the desert at the time, he tried it once, and nothing happened. “Tasted like rock”, he said. He had a dog who would chase thrown rocks, once. It wasn’t a purebred border collie, of course. I never hurt anything I see in the garden. It’s live and let live around here. We don’t either, except when plants get stepped on ….. I gotta get me some C. coum. Beautiful crocus and cyclamen, and, oh, those snowdrops! Quite a lovely foot-of-jade spot you inhabit, Chess, such a *particular* light in the sky. 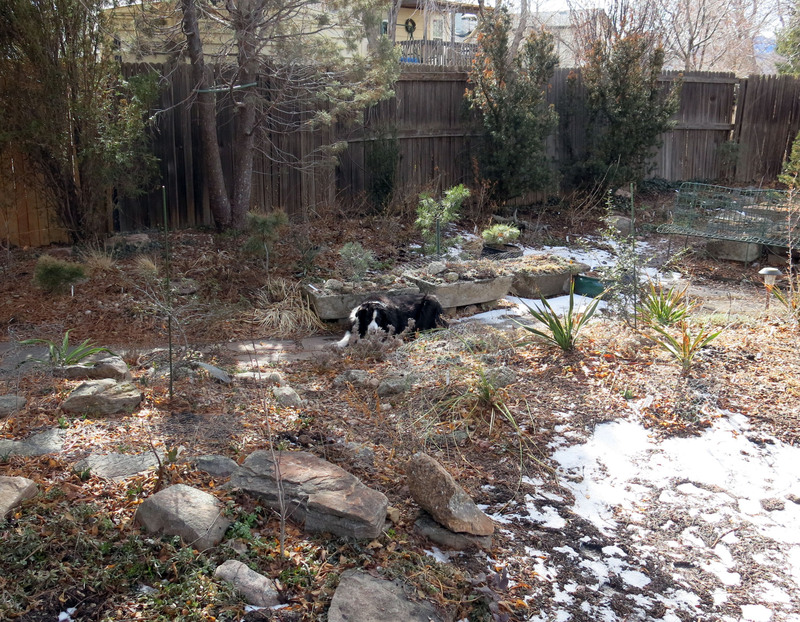 Of course those are extremely excellent garden shots, such a sweet border collie inhabits within. Your of-the-moment portrait today is as-usual adorable and also seems especially characteristic. No chance we will “rescue” our Brazilian button plant that has spread down the block, although I think you, Chess, would appreciate its lemony-menthy scent. All the dogs are eating dirt in Dog Park these days. My husband’s theory is the lawn is treated with fish fertilizer. My theory is based on the certain knowledge the park is built on a landfill and that the recent rains have brought out the earthiness dogs crave. Thanks; yes, dirt is excellent, though my personal favorite, which I shared with my buddy Slipper, is potting soil. I can’t really recommend a brand, though. Most of the potting soil here is homemade, but store-bought is the best. The guy I live with used to get really mad at us when the flower pots were all emptied and then there was potting soil floating in our water dish. Someone once said it was because we needed minerals we weren’t getting, but then, they’d never tried potting soil, so they didn’t really know. The guy I live with says he can’t take pictures of all the snowdrops growing together because some galanthophile in England might see them and scoff loudly enough that it could be heard from here. It’s not a very big assemblage. Ahhhh, you do bring the winter garden to life! 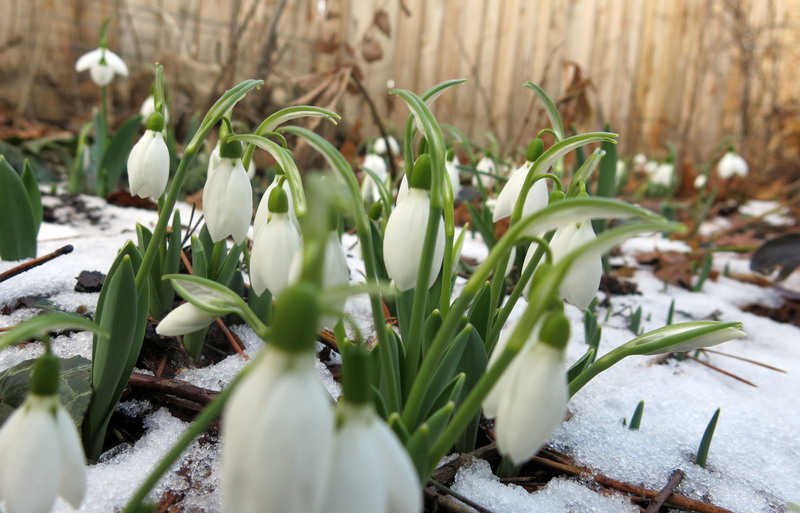 The snowdrops look great and your photo is nothing to laugh at. I cracked and spent a ridiculous amount of money on a handful of new ones and I’m sure there will be no photos posted. The chorus of snickers would be overwhelming. We would just ignore those snickers, of course. (If that link doesn’t work, just go to rareplants.co.uk and click on galanthus. Please note that we take no responsibility for any resulting financial excesses. And that they sell a CITES permit for 75 pounds sterling which you have to purchase. Plus one pound fifty for each bulb. The guy I live with just spent $90 on antibiotic for me (true, it lasts for a couple of months), so it’s a good thing he already ordered from Temple Nursery. That wasn’t very nice at all. It’s a good thing my snowdrop budget was exhausted months ago or I’d be tempted, but after needing to borrow from the ‘new refrigerator fund’ in order to pay my Temple Nursery bill I think it’s time to take it easy. You probably shouldn’t mention that Cornovium Snowdrops is selling to the US this year. At an almost reasonable 20 pounds sterling plus two pounds per individual bulb, even the strongest resolve might break when faced with a warm spring day and a suspected snowdrop shortage. I’ll just say my wallet is much easier to carry around these days. Well, that’s why we posted the link now, figuring that budgets would be exhausted, though now the guy I live with is taking a serious look at Cornovium and thinking. I can hear it; sounds like a 1950 Rambler with a thrown rod. The guy I live with tried to persuade someone going over there to the U.K. to wear a special overcoat with hundreds of small pockets, and sporting a look of Ultimate Innocence, which of course they would get by studying me. It worked about as well as the time he tried to persuade someone to go to Afghanistan to collect seed. Maybe he should have offered more than ten dollars. 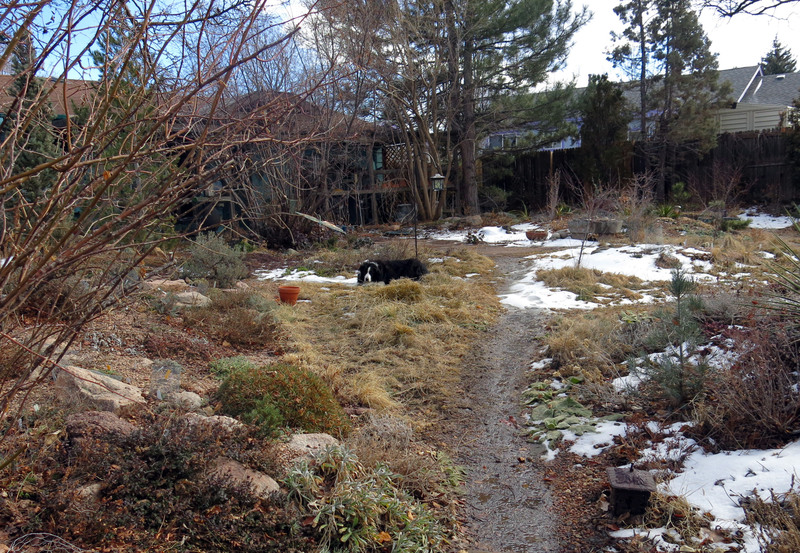 Yes Chess they are excellent garden photos, I thought you may have been eating dirt as there is no snow on the path. Who is your brown friend behind you to the right? Are you still getting out for your morning and afternoon walks? I love the snowdrops as usual and now I can’t wait for those cyclamen to start rising everywhere. Thanks. No, I don’t go for walks any more. The anemia makes me tired. I don’t really miss them, I guess, because I get extra cuddles. Oh, the brown friend, that’s an iron javelina that my mommy bought. The sculpture came with piglets following, but my mommy didn’t want to get them, though the guy I live with said she should’ve, and now the piglets are long gone. One of those metaphor things. You can see some of the iron bats hanging by the shed, too.